Freemake is the far-famed free software for you to free download YouTube videos, Facebook videos, etc. And in the past few years, it had always been functioning well in video free downloading tasks. But that seems to be changing. Freemake users keep posting various Freemake problems on Facebook, Blogs, SNS and forums, among which Freemake video downloader not working issue is the limelight. In response this issue, I'd like to share some personal tips with a desire to help you solve Freemake Video Downloader not working problem with greatest of ease. 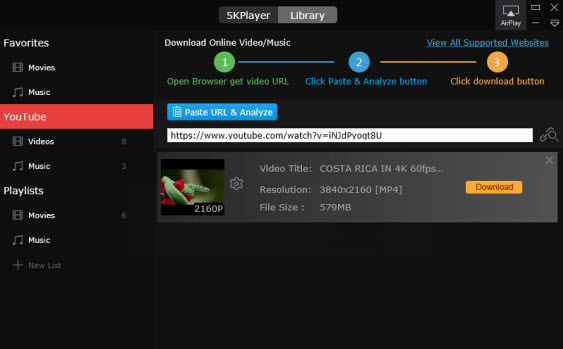 It's no longer a secret that Freemake video downloader is specifically designed for PC Windows users to get online video music free download. For Mac users, it's sorry to tell you that Freemake YouTube Downloader is not working on Mac computer. In such case, you're suggested to resort to the best alternative to Freemake video downloader-MacX YouTube Downloader, which delivers an excellent performance in free video downloading task on Mac OS, no matter video music free download from YouTube, Facebook, Dailymotion, or Vimeo, Vevo, Myspace, Instagram, etc. over 300 video music sites supported. And the whole online video free download task can be finished just a click away within mins regardless of online video formatted with MP4 MOV MKV AVI or resolution in 720P, 1080P, 4K 8K Ultra HD. Step 1: Free download the top alternative to Freemake on Mac and launch it. Find a video you'd like to download, copy the URL of the video page and open this free YouTube downloader. Then paste the URL and click "analyze" to load the YouTube video details. Or click "paste & analyze" button to automatically detect the YouTube video opened in browse. Step 2: Choose video format, resolution and file size you desire. And you can also set to automatically adding the output MP4 videos to iTunes Library for further use. Step 4: Hit "Download Now" to start downloading video from YouTube on Mac for free with the Freemake alternative for Mac (Mojave). can't download any video from youtube with freemake, what happened to freemake, it was the best but from the past 15 days it's having lot of issues and no downloadable video url etc etc issues. I am getting a "no downloadable video at this url" message from Freemake. This is happening with all YouTube videos. It just started doing this yesterday. Yes, it's undeniable that Freemake is compatible with Windows PC, but that doesn't mean there is no Freemake error happening in video downloading on Windows. And the possible reason for Freemake YouTube Downloader out of work lies in the lagging updates on Freemake Video Downloader, for YouTube has frequently changed their algorythm to prevent users from YouTube video downloading. And the same applies to other online video sharing sites like Facebook, Vimeo, Vevo, etc. So the first solution you are supposed to try is to free download the latest version of Freemake Video Downloader to check if it works in online video downloading. If, unfortunately, this method doesn't work for you, it doesn't matter. Here comes the second yet once-and-for-all solution-free download Freemake video downloader alternative for Windows. And the highly sought-after 5KPlayer is regarded as the best choice, which wins the silver award on the Softonic top downloads of free media player. Actually, this free video player is not merely a media player freeware. It's also the cover-all online video music downloader for Widnows 10/8/7 to let you free download any video music from YouTube, Facebook, Vimeo, Vevo, Instagram, Dailymotion, etc. 300+ video sharing sites with perfect aplomb as it has been constantly updating to catch up the YouTube algorythm changes. Step 1: After free downloading the best Freemake alternative 5KPlayer on Windows PC, go to the YouTube official website and find the YouTube video you wanna download. Step 2: Copy and paste the link of the video into the analysis box of this free YouTube downloader. Step 3: Click the analyze button beside the box and wait for this video downloader alternative to Freemake analyzing the URL. Step 4: Press the setting button to choose the target resolution and format before downloading YouTube video music. Step 5: Tap the HD video download button to download the video from YouTube with splitting speed.